For less than the price of one lesson with Joe you'll be receiving thousands of dollars worth of information, more than 10hrs of Video instruction & 2 Complete books written by Joe. Joe is one of the most unique players you’ll ever have the chance to train with. Started working full time while going to night school when he accidentally walked into a weekend pool tournament where some of the best players in New England were competing. As he stood viewing the front 3 tables he was thunderstruck when he saw each player maneuvering the cue ball perfectly from shot to shot while playing 9 ball. It was that moment that Mr. Tucker thought “I know nothing” and immediately started seeking knowledge everywhere he could. By coincidence his very first Accu Stat video match that he watched was Allen Hopkins vs “HEY that’s the guy, the guy from Georgia” David Howard. That was 1988, in 1991 Joe won his first of 8 Rhode Island State Championships and was on his way to becoming a professional player on the Camel Pro Billiards Series. This is not a step by step beginners course in Pocket Billiards. You are gaining access to advanced knowledge on important topics with real products that have a proven reputation (just google them). The total retail price on the products you're about to access is $180 and you get it all right here in an easy to follow outline. Joe Tucker is one of the best instructors in the country and the skills you pick up here with him can help save you thousands of dollars, advance your game faster than it ever has and maybe more important to you, it will save you valuable time while improving at this great game. Time is the most important thing we have and yours will be wisely spent working with Joe. Anyone can give a lesson or make up a drill, the question is; Was that time well spent? 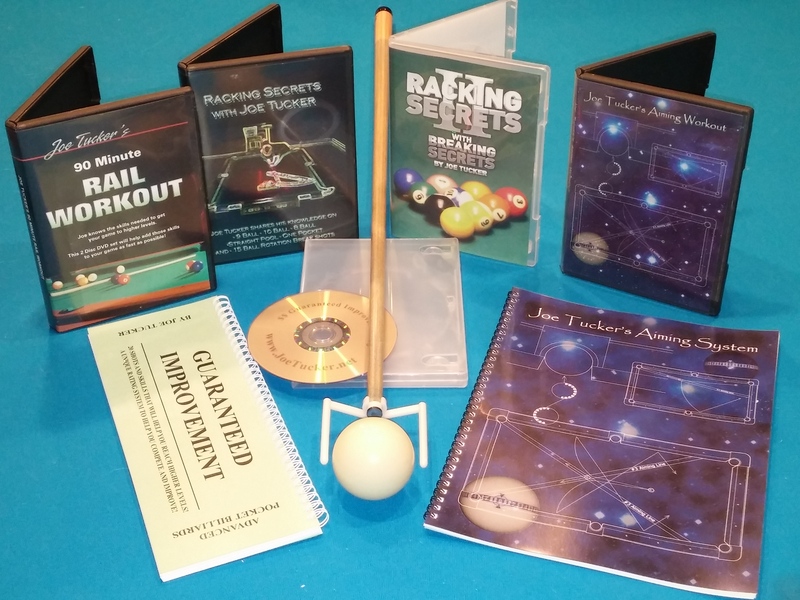 In most cases the answer is No, there are thousands of things you can learn about Pocket Billiards but some are much more important than others and this is where you want to spend your time. Normally this is a $180 package that's worth thousands in lessons. Here we're saving time with instant access, money on shipping and getting a tremendous value. Joe loves the game, won't blow smoke and promises to make you a better player. We're giving you a lot of knowledge at a great price, enjoy and feel free to write anytime. 7 Sections & 32 Lessons that you'll be able to take notes on, keep scores & track your progress! The 30 Day Guarantee below refers to technical problems only.